What is IPM (Integrated Pest Management)? A sticky apple-shaped trap in the orchard. We do offer a choice of certified organic produce as much as possible, but for those families that aren’t interested in or able to afford organics all of the time, we have an alternative: minimally sprayed fruits and vegetables, known as Integrated Pest Management or IPM. Integrated Pest Management (IPM) is a method of reducing pests, and the diseases they cause, using a combination of common-sense techniques. When the amount of pests in an orchard is reduced naturally, there is less need to apply pesticides. And even when the natural methods fail to some degree, IPM growers are careful to limit their spraying to areas that really need the pesticides, rather than spraying the whole orchard. Scouting & written record keeping is the foundation of a good IPM program. Growers regularly inspect their crops for signs of harmful insects, disease and weeds. Records that note which pests were sighted and how they were dealt with help the grower make future decisions to prevent damage to his crops. Planting pest and disease resistant varieties in the orchard helps to minimize the need to control pests. A pheromone trap among the apples. Degree Days: By calculating the “degree days” based on daytime and nighttime temperatures, a grower can pinpoint exactly when a certain insect will hatch. 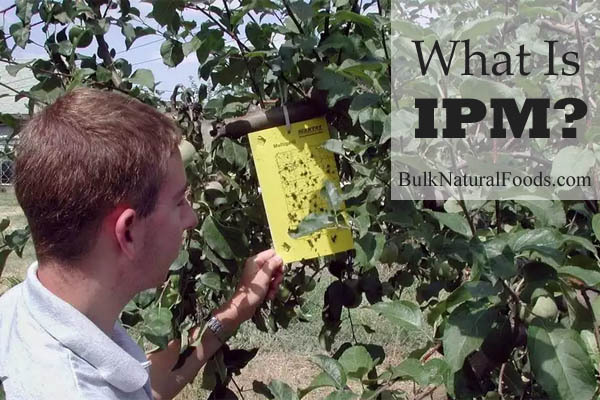 This enables our IPM growers to spray once, exactly on the day the insects hatch, and wipe out a vast majority of the problem insect population in their orchard. Mating Disruption is a strategy that uses pheromones to confuse male insects and limit their ability to find females for mating, which in turn, reduces the next generation’s population. Targeted spraying is spot treating a problem area of the orchard rather than spraying all the trees, and it’s only done as a last resort, after natural means have failed. Even though IPM orchards use chemical sprays, they are careful to use “gentle sprays,” pesticides that conserve natural enemies of pests and pose the least amount of risk to the farmer and the environment. Other common-sense practices include cleaning up dead trees, pruning, weeding, mowing and mulching. Basically, IPM uses a lot of prevention and only a little bit of cure. No, it’s not organic, but it’s a lot better than carelessly spraying on schedule. We think buying from IPM growers makes a lot of sense. Even though it’s a step away from being organic, IPM prices make this natural produce available to many more people at a fraction of the price of organic fruit. 4 Responses to What is IPM (Integrated Pest Management)? LOVE what I have heard and the idea of IPM. I would like to know exactly what ” ..limit their spraying..” in reality ends up as. I think a comparison chart of what is “normal” spraying vs. typical or general IPM spraying amounts actually are would be the most helpful to the consumer. I’m interested in Karen’s request from 2012 as well. We usually do not purchase dirty dozen crops which include peaches, apples and berries. I’d love to know how the IPM fruits compare because we might be interested in buying them if they aren’t inundated with pesticide. Thanks! Although we’d love to provide a chart of some kind, the problem is that it would become outdated possibly within weeks and definitely from one year to the next. 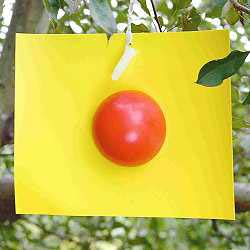 Some years, our growers don’t have to spray anything on their trees at all. Literally nothing. But other seasons, they do. It all depends on the weather, what pests are a problem during the particular growing season, the strength of the trees (which is affected by the previous year’s harvest), and other factors. I know that really doesn’t answer your question, but I hope it helps somewhat. After I posted my answer to your question, I realized I could have given you a little more information. But when we talk with growers who spray as minimally as possible, they tend to light up when we ask how their fruit is grown and launch into an explanation of the records they keep, the scouts they send into the orchard to check on the fruit, the many kinds of insect traps they keep in the orchard, and how they use mating disruption to keep the pest population down to a minimum. So although we can’t provide a chart, it’s encouraging to us when a grower gives this kind of answer, and those are the growers we’re purchasing from when we label a product as IPM or minimally sprayed.